Relive the medieval glory of Florence with a professional photo-shoot in the birthplace of the Renaissance. Enjoy the rare opportunity to dress up in a magnificent handcrafted period costume and pose for photos in some of the city’s most beautiful settings. Not only will you get to feel like a VIP for your private photo-shoot, but you’ll receive the ultimate souvenir – professional portrait photographs worthy of a place in the Uffizi gallery! 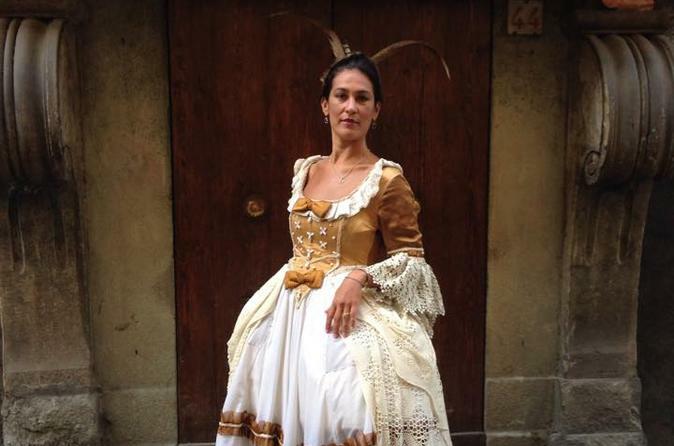 Meet your photographer at your Florence hotel or private residence and get dressed up in your hand-made medieval costume. Feel like royalty as your guide helps you fix your headpiece, put the finishing touches to your make-up and choose suitable accessories to match the period style. After around 30 minutes to get suited up, head out to your first photo-shoot location to begin your shoot. Select your shooting locations with help from your photographer, perhaps opting to pose on a beautiful terrace, in a pretty flower-filled garden or inside opulent hotel lobby. Alternatively, take to the streets of Florence and strike a pose by landmarks like the Ponte Vecchio. As the lighting and backdrop are set up, listen as your photographer sets the scene with stories of your costume and character. Then, enjoy your moment in the limelight as you try out different poses and photo styles, and follow the advice of your photographer to ensure you capture the most memorable shots. After an unforgettable photo-shoot, head back to your hotel and change back into your regular clothes. Finally, bid your guide farewell and await your finished photos. Please note: Your photos will be available within 3 to 5 business days and will be sent to you via email in high-resolution digital format. Special requests, for example if you would like to be shot by Ponte Vecchio or other attractions, will be taken into consideration, but are dependent on weather conditions, crowds and departure time.